Crostini is an Italian appetizer prepared with toasted bread and vegetarian /non-vegetarian toppings. Though I have been intending to make Chicken Crostini for quite sometime I never got around to doing it, mainly due to my aversion to handling raw meat. This is why all my cooking has been restricted to vegetarian preparations, despite my being a semi non-vegetarian. Tired of hearing my rants about wanting to make chicken crostini, my mom sent across boiled & shredded chicken last week, much to my surprise. So, after several months of dilly dallying I finally got around to making my first non-vegetarian dish, Chicken Crostini. 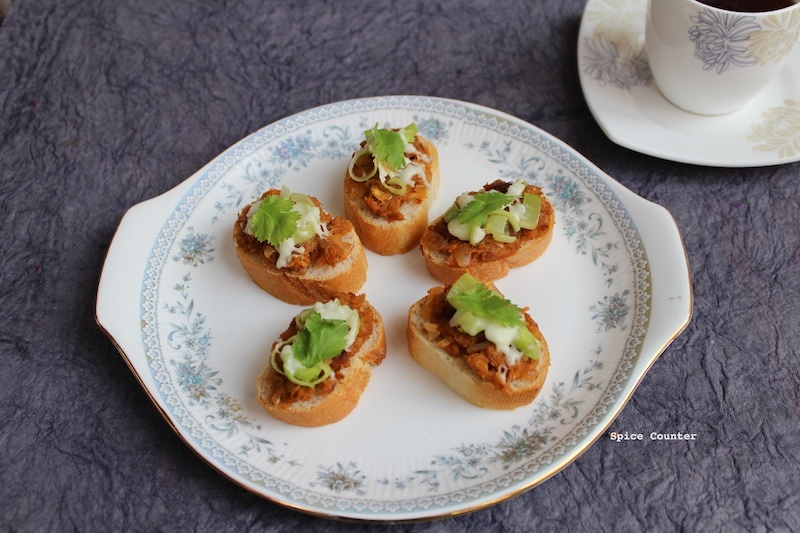 Chicken Crostini is easy to make and is an ideal appetizer for small dinner parties hosted at home. Add ginger, garlic and onions. Fry till the onions are transparent. Now add the boiled & shredded chicken and the sauces. Add salt to taste. Note that soya sauce has salt in it, taste & add salt accordingly. Keep the mixture aside. In the same pan add ½ tsp of oil and fry the leeks for a minute. Brush both sides of the baguette with oil and toast it. Place a generous helping of the chicken topping on the baguette. Top it with a little bit of leeks and grated cheese. Preheat oven to 350 F /180 C. Arrange the crostinis on a tray and bake for 2-3 minutes till the cheese has melted. Serve hot!! Looks yummy! Tried this last week. Was not happy with the results. This looks really good and yummy. You have to make it for me when I come there in summer.